Milkman Sound - Andertons Music Co.
Milkman Sound is a US-based manufacturer that specialises in producing classy, vintage-flavoured valve amps with equally retro aesthetics. With several high-profile endorsees, the company seem to be going from strength to strength! Milkman guitar amps are all handmade in San Francisco by a small team headed up by Tim Marcus, who named the company as an homage to his family – they were all milkmen! Tim developed a curiosity surrounding valve technology (or ‘tubes’ as they’re known in the US) while working in a TV and Stereo repair shop after graduating college. His curiosity turned into a hobby when he was mentored by frequent visitors to the shop who shared their knowledge on valve amplification. Combining his knowledge on repairing electronics with his new-found knowledge of the inner-workings of valve technology, he started making amps alongside his day job before ultimately taking a leap of faith in 2014; Milkman Sound was born! Individualism formed a pivotal part of Marcus’ ethos; he knew he wanted to create something that was wholly original, while being familiar and practical. Nowadays, Milkman amps are known for producing beautifully vintage, highly responsive tone, but it all stems from personalised voicing and unique designs – nothing is copied. It’s this individuality and commitment to quality that’s helped put Milkman on the international map, lauded by the likes of John Mayer among others! Milkman offer a vast range of stunning boutique valve amps, all handmade in San Francisco. Andertons Music Co. are thrilled to be one of their exclusive Europe dealers! Their range covers just about everything you’d want a modern boutique amp range to cover, but each amp shares a number of common themes; they’re all valve-powered, and they all boast slick retro aesthetics. Many of the amps come in a variety of ‘finish’ options, including vanilla tolex and chocolate milk (obviously!). You also have a huge wattage range to choose from, depending on your requirements, ranging from a 1-watt 1x10” combo to the monstrous 300W Pedal Steel Half and Half combo! 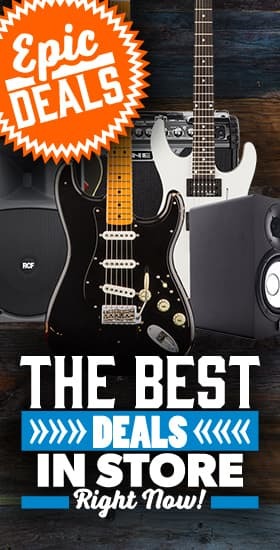 Whether you’re looking for an organic home practice solution or a full-tilt gigging amplifier, you’ll find something that suits your needs in the Milkman range! Many of their amps also come in head form, so you have a little more flexibility in terms of your stage setup, with a great selection of cabinets to choose from, all of which match the old-school aesthetics! One of the most exciting products in their vibrant range is ‘The Amp’, an aptly-named pedal that conceals 50W of 12AX7 power. This incredible unit has built-in analog tremolo and digital spring reverb, with a neat selection of tonal shaping options; this is literally a full-blown amplifier in a pedal, that can be used either as your main performing amp or a valve-driven boost! We offer free UK delivery and 0% finance options on our entire Milkman Sound selection – check out the full range below!